A few weeks ago even before our trip that yielded the Sharing story Alyce and I attended another event at the Early Childhood Center "Dad's Night Out". 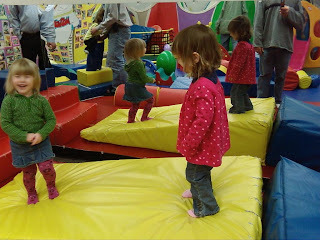 It was an event held for the Dad's to bring in their kids for some father kid quality time. The event is fairly low stress with no scheduled activities. 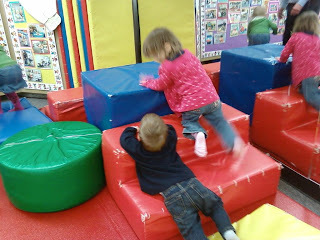 It is a lot dads playing with different things alongside of their children. 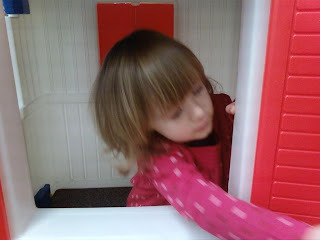 The main items for Alyce anyway were the Little Tykes toy cars, heavily padded climbing blocks, and a plastic toy house. 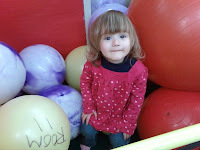 These are all things that Alyce has played with in the past but they still hold her attention. 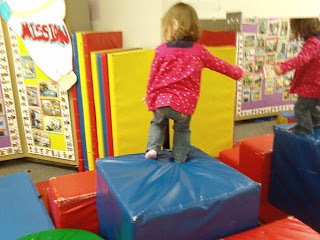 The blocks were especially a hit as Alyce has been practicing her jumping skills and a place where everything is padded is a great location to do it. 0 comments on "Dad's Night Out"